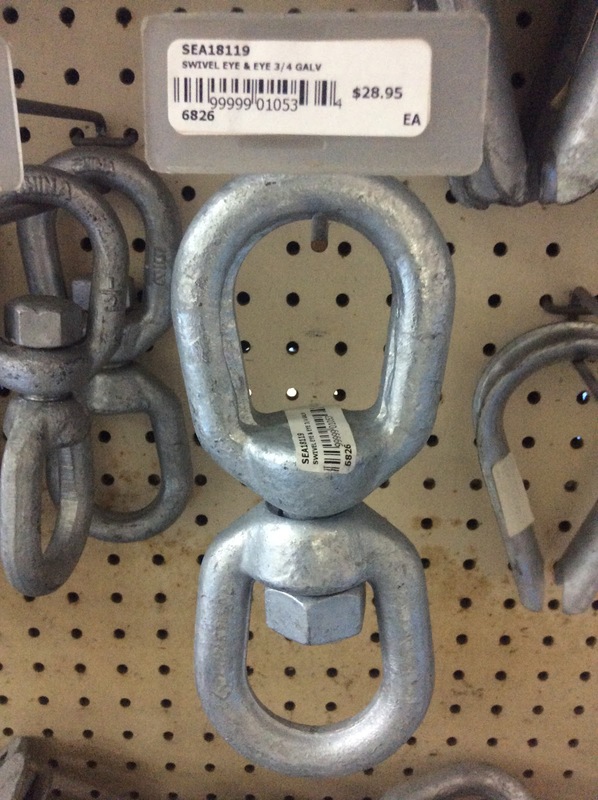 Back in February of this year a swivel parted on the mooring our boat was tied to in St.Croix. We were not aboard at the time. 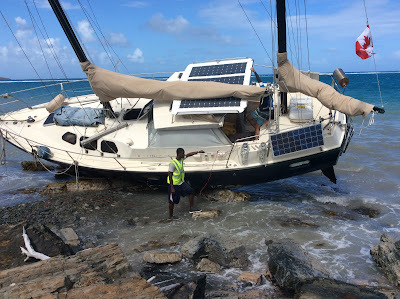 The boat went ashore and was damaged beyond reasonable repair. Finally got around to writing a blog post about it. So sad to see the damage. Thanks for the post. 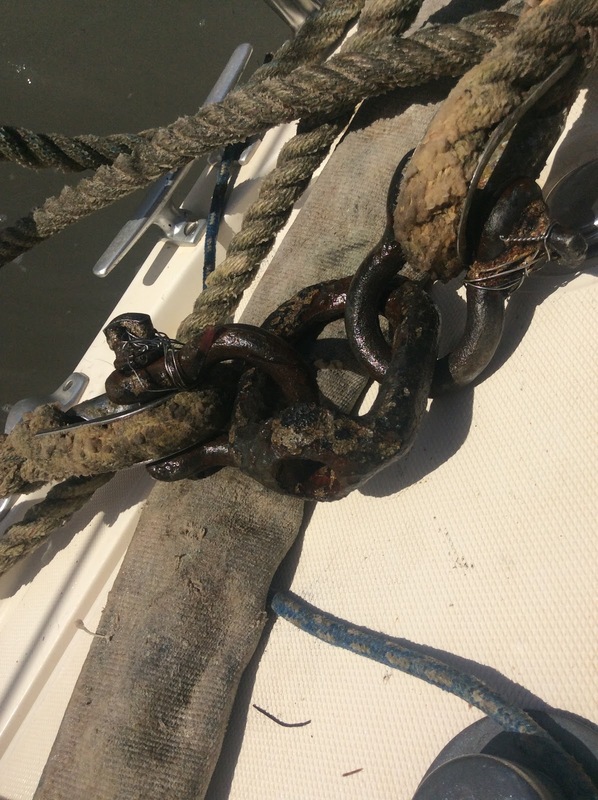 It is a timely reminder of the importance of each component in a mooring, or even an anchoring system. Reminds of a saying, "for want of a nail..."
Where was the mooring in St. Croix? Teague Bay, near the St. Croix Yacht Club. Was the nut on the failed swivel welded? Yes it was the welded type. I had a look at it by pulling it up as close to the surface as possible when we took the mooring. At that point it had some growth on it, but seemed intact. In the pic I posted of the failed swivel on deck all the growth has been cleaned off, presumably by being dragged over a mile of sandy bottom. Gees, cannot even trust a simple weld today and at great cost! I am sorry for your loss. I never saw what happened to the bolt/pin. We were too busy with the salvage and were already in a hurry to return home before the wreck, so we left as soon as everything was cleaned up. I'd be very interested to see the other half of that swivel. That's horrible, heartbreaking. I hope you can get another boat if you still want to cruise. Horrible. My greatest sympathy. I hope you were insured? It's a useful warning about moorings. If you haven't dived on them yourself or had them inspected yourself or otherwise know for sure that they are properly maintained -- you can't trust them. I much prefer to be on my own gear. Some friends have offered to lend us their boat for this season. Not sure if we'll find another boat to purchase or not. Despite this awful event all of us would still like to continue cruising, it has been wonderful. After the wreck My ten year old daughter said "in a few years this will just be a little mud stain in our lives". A good warning for anyone using a mooring. So sorry to hear about the loss of your boat. That is sad. Your child has a good attitude about the loss and life. Good! 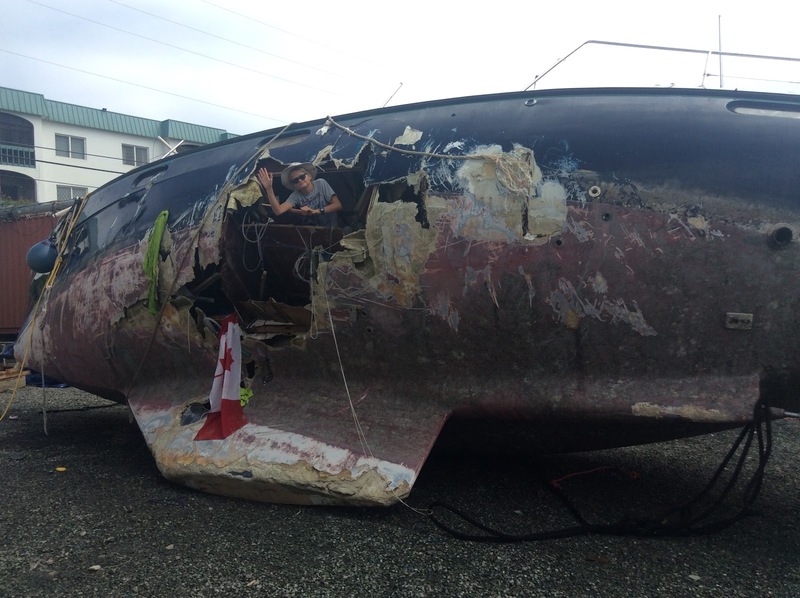 We were not insured for a number of reasons: not an expensive boat, insurance too expensive, too restrictive. Never had a problem in about 40K miles of cruising. The boat we are borrowing is insured. Not sure what we will do if there is a next boat for us. This is an interesting (scary) point. I had this swivel in my hand before the wreck. I was in our dinghy and pulled it up to just below the surface. It was covered in slimy growth, but seemed intact. I think the problem is that it was a $15. (in USA, $30. in St.Croix) unrated swivel vs. an $80. (in USA) Crosby rated swivel. How could you even tell the difference when it's been submerged for a while ? One of my "could have's" is that we could have tested the mooring by backing down on it. We plan to cruise again, and will probably take a mooring again at some point. I'd like to hear what others do as far as checking moorings ?